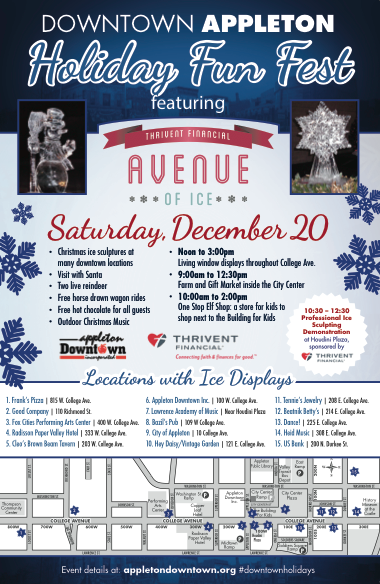 Posted on Dec 16, 2014 by Appleton Downtown Inc.
Holiday Fun Fest is a brand new event in Downtown Appleton featuring Thrivent Financial's Avenue of Ice. and more in Houdini Plaza 10:30am-2:30pm. Plus Live Window Displays noon-3pm and Ice sculptures along the Avenue! Was wondering if there was a list published of who the ice sculpurists will be. All carving is done by Krystal Kleer Ice Sculptures.